Putnam County Playhouse: The Addams Family is Coming! 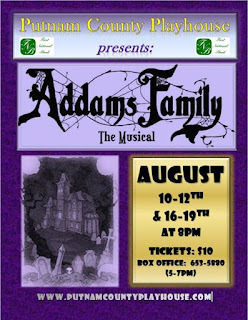 Putnam County Playhouse’s third production of the 2017 “Season of Laughs” is a musical comedy, The Addams Family. Show dates are August 10, 11, 12, 16, 17, 18, 19. Tickets are available beginning Monday, August 7, 2017. Tickets may be obtained by calling 765-653-5880 from 5 – 7 p.m. or stopping by the box office at the theater from 5 – 7 p.m. The characters are the same as you might remember from the 1960’s television show: Gomez (Joshua Saul Bain), Morticia (Tarah Thornburg), Wednesday (Chloe Hayes), Pugsley (Devin Huff), Lurch (Michael McClaine), Uncle Fester (Brad Sandy), and Granny (Caroline Good). This time around, the unsuspecting Beinecke family has been added including parents Mal (TJ Tincher) & Alice (Shelly McFadden) and son, Lucas (Cameron Callan). The Addams Family features an original story, and it’s every father’s nightmare. Wednesday Addams has grown up and fallen in love with Lucas, a sweet, smart young man from a respectable family. A man her parents have never met. And if that weren’t upsetting enough, she confides in her father and begs him not to tell her mother. Now, Gomez must do something he’s never done before – keep a secret from his beloved wife, Morticia. Everything will change for the whole family on the fateful night they host a dinner for Wednesday’s “normal” boyfriend and his parents. The Addams Family ancestors sing and dance throughout the show and are played by: Sarah Arnold, Sarah Bond, Samantha Flannelly, Drew Harris, David Lorimer, Bryana Perry, Winter Prewitt and Stephanie Zhivotovsky. Ric McFadden is the director of the production and serves as vocal director. Isaiah Mattas, Josh Bain and Sarah Bond are the show’s choreographers. Sound and lighting design is by Dustin Bond with set design/construction by Linda Gjesvold. Shelly McFadden is the costume designer for the show with make-up/costume assistant, Susan Price. Stage Manager, Jessica Masner is assisted by stage hands: Mason Allen, Mariah Taylor, and Cameron Wunderlich. Darvell Barger is the sound board operator and Haley Wilson is the light board operator. Spot light operators are Sarah Nowling and Grace Elmore. The orchestra for The Addams Family is led by pianist, Marilyn Rush. Morgan Asher plays keyboards for the production, with Drew Brattain on bass and Dedee Schwomeyer on drums. The Addams Family is sponsored by First National Bank.